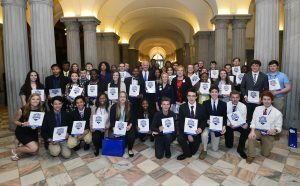 (Columbia, South Carolina) – Today, 94 South Carolina high school seniors were recognized at the 3rd Annual S.C. STEM Signing Day by Boeing South Carolina, BMW Manufacturing Co. and the South Carolina Manufacturers Alliance. S.C. STEM Signing Day recognizes students from across the state of South Carolina who have pursued STEM (Science, Technology, Engineering, and Mathematics) education during their high school tenure and plan to continue their STEM education at two and four-year colleges. Students were identified through the SC Future Makers initiative using the Tallo platform. The list of students is available by CLICKING HERE. The list includes the students’ current high school, home county, and the college and major the student will attend in the Fall of 2019. Photographs of the students receiving their recognition are available by region upon request.